In geometry, when a cone and a plane intersect, a conic section results. A conic is the curve got by intersecting a plane, called the cutting plane, with a cone. The cone is a right circular cone for easy description, but any double cone with some circular cross-section will do. 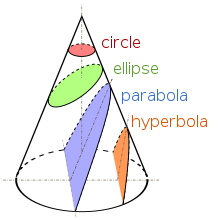 There are three different types of sections, the parabola, the hyperbola and the ellipse. The circle is a special case of an ellipse. Sometimes the circle is mentioned as a fourth type, because calculating with a circle is easier than with an ellipse, most of the time. The conic sections are known at least since 200 BC, when Apollonius of Perga (~262 BC to ~190 BC) studied of their properties. They came to more attention when mathematicians discovered that the solutions of the two-body problem were conic sections. This page was last changed on 14 March 2018, at 20:53.